Following their arrival in France at the end of March 1916, the soldiers of the AIF were introduced to the Western Front in the British Expeditionary Force held French Flanders, close to the Belgium border in what was known as the Bois Grenier or Fleurbaix sector. By the time of their deployment in Spring 1916, this area had seen little serious fighting for almost a year and as a result earned its nickname of the ‘nursery sector’ where new formations of the BEF could be introduced to trench warfare. 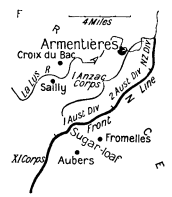 Between May and mid-July I Anzac comprising the AIF 1st, 2nd and the New Zealand Divisions held a 15 kilometre front from the River Lys in the north, passing Armentieres to a point opposite the German stronghold known as the ‘Sugarloaf’ near the village of Fromelles. When the AIF 1st and 2nd Divisions moved south to the Somme, they were replaced by the 4th and 5th Divisions, and later in 1916 the 3rd Division also received their baptism of fire in this sector. For the infantry of the AIF the flat terrain of the Bois Grenier sector (photograph right) was in stark contrast to the rocky conditions faced at Anzac in the Dardanelles, and the hot sands of the Egyptian desert where the AIF had been regrouping and training following the Gallipoli evacuation. In this sector, and as a result of the water table being just below the surface, the defensive systems were not trenches but breastworks (photograph below) built upwards of earth-filled sandbags. As with the majority of the Western Front the Germans held the higher ground, which in this sector was the Aubers Ridge, and although not that high still gave the Germans an advantage for spotting enemy movement. To help with concealing activity night was thus the most active period for patrols and fatigue parties repairing and improving the defences and moving men and materials. There were other differences too. Scarce provisions which had to be shipped in to Anzac were replaced by water being piped forward and fresh cooked meals being carried forward from the field kitchens. Also in Gallipoli there were no safe areas where the Battalions could rest and as a result were in the front for months at a time, where on the Western Front they were rotated in every six days and had frequent breaks to the rear where, although not immune from long-range shelling they could take baths, be billeted in villages and farms, and enjoy local beer and wine. Many of the troops would frequent the restaurants and estaminets (small bars and cafes) of Armentieres, the main British centre in French Flanders, also made famous by the wartime song ‘Mademoiselle from Armentieres, parlez-vous?’ which alludes to another behind-the-front activity for some of the troops! By the time the AIF had arrived on the Western Front, the Allied forces were already on the back foot on account of the German offensive at Verdun which as an attritional campaign was designed to ‘bleed white’ the French nation of its fighting force, forcing France to capitulate and lead to Britain withdrawing from the continent. As a result the planned joint French-British Somme summer offensive would be stripped of dozens of French Divisions meaning that the BEF would have to lead it with fewer men than originally planned. General Haig therefore gave the command that in support of Rawlinson’s Fourth Army that would mount the Somme offensive, the three other armies of the BEF should carry out as many raids as possible to act as a diversion and wear down the German divisions that would be used for reinforcements. Hence it was this type of raiding activity that became the dominant feature during the AIF’s stay in this sector. The first relief by Australians on the Western Front began on 7th April 1916, with the AIF 21st Battalion relieving the 10th Lincolnshire near Fleurbaix, the 22nd Battalion with the 11th Suffolk, and the 27th and 28th Battalions (7th Brigade) taking the place of the 20th and 21st Northumberland Fusiliers near Rue Marle, Armentieres. Arrival on the Western Front brought welcome additions to the equipment for the men of the AIF. Steel helmets were issued to protect against shrapnel. Each battalion received four Lewis light machine guns (this number would increase as the war progressed), the effective Mills bomb (hand grenade), and at a Brigade level the new light Stokes mortar. Each Division also received more guns into the field artillery brigades as well as howitzer brigade for greater range. The flip side was in addition to precision enemy artillery bombardment and sniping, the AIF in the nursery sector had to endure frequent sorties and attacks by German aircraft, gas attacks and getting use to wearing the cumbersome gas masks, and the highly effective German Minenwerfer medium trench mortar. Raiding was of course conducted by both sides. On the 5th May 1916 there was heavy German bombardment on the 20th Battalion holding the Bridoux Salient to the south-east of Bois Grenier, causing about 100 casualties. The bombardment was followed up by a German raiding party but quickly retired without losing a man, and taking with them eleven prisoners and two Stokes Guns which up until this point the British had been trying to keep this new trench mortar as a secret. Through this action German intelligence was able to confirm the presence of the Australian 2nd Division in France, but the importance of the Stokes Gun to the British was at this stage not appreciated by the Germans. However, this first engagement by the Australians in France was a major setback and embarrassment for the Australian commanders and their troops and the loss of the two Stokes guns rapidly became known throughout the army. Disciplinary measures were taken with Court Martials for the two officers in charge of the mortars, and with the Commanding Officer of the 20th Battalion being sent back to Australia. Another well planned and executed German assault on the 30th May in the Cordonerrie Salient resulted in a total loss for the 11th Battalion of 131 casualties, with 47 killed and 11 missing. Following the German raid on the 5th May, British command restrictions on the use of artillery shells was relaxed with a trebling of the Australian field gun and howitzer allowance. This meant that they were more able to retaliate against any enemy bombardment. Retaliation however worked both ways, and on the 21st May when the Anzac heavy artillery bombarded and destroyed the church spires (used for observation) at Radinghem, Le Maisnil as well as the Chateau d’Hespel, the German artillery responded in kind shelling the church at Fleurbaix and the village of Erquinghem. Although constant attempts had been made to capture Germans in No-Man’s Land, it was not until the 28th May that a prisoner was taken – a private of the 20th Bavarian RIR who had been out on patrol and had lost himself for two hours in the fog, stumbled into an Australian listening post and surrendered. A week after the enemy raid at the Cordonnerie Salient, the Australians undertook their first similar attack on the Western Front. This minor action by the 2nd Division was soon followed by a raid by each of the two other divisions, and then by a series of similar raids that formed part of the subsidiary part of the general plan of the Allies. In the early hours of 6th June the 7th Brigade, drawing men from the 26th and 28th Battalions under Captain Foss, conducted the first raiding party by the Australians near Armentieres. The raiding party, for which volunteers were called, comprised of six officers and sixty men. In preparation the men were withdrawn to the rear where they trained, using mock-ups of the enemy positions, for two weeks, and in this case were assisted in the training by two Canadian officers – the Canadians were attributed in pioneering this type of warfare near Messines during October 1915. The raid was a success, with three prisoners being brought back and some seven of the enemy killed. However upon their return, the Australian raiding party suffered six casualties, two of which were killed, by the retaliatory bombardment, and there were twenty casualties in the trench garrison from the artillery retaliation. This action had the effect of raising the confidence of the Australian infantry and removed some anxieties now that some of their mates had been in the enemy line. The soldiers that conducted the Brigade level raids wore special tunics with badges and insignia removed to hinder identification in case of being killed or captured and had their faces and bayonets blackened to help conceal their movements. Weapons of choice included revolvers instead of rifles, and clubs and knives to be used at close quarters. Between the 25th June and 2nd July, I Anzac launched a dozen raids on the German lines, the largest of which was conducted by the 6th Brigade under the command of the 22nd Battalion‘s Capt. Wiltshire. It was during the first raid conducted by the 5th Brigade that Private William Jackson of the 17th Battalion was awarded the first Victoria Cross by an Australian on the Western Front, and at 18 years old remains the youngest Australian recipient of this highest military award. By the end of this short period the Germans were becoming accustomed to the raids and hence their effectiveness became reduced with increasing casualty rates, and as a result were becoming detested by the troops being tasked with the raids. Militarily the raids did little as a distraction or diversionary tactic, but they did play an important role in building the confidence of the Australians in this new theatre of operations, and alleviating some of the anxieties faced about how they would fare in the enemy lines. In addition, on the 27th April it was the first time that the infantry of the 2nd Division had seen a barrage by its own artillery on the enemy parapet and as an event had an impact on morale showing that when required they could rely upon the accuracy and performance of its own guns. Although the AIF 5th Division had not fully arrived, of the 338,000 troops within the British Second Army at this time, over 80,000 were from Australia and a further 20,000 from New Zealand. This number was about to be reduced with the withdrawal of I Anzac Corps (AIF 1st & 2nd Divisions) and the AIF 4th Division to join Rawlinson’s British Fourth Army engaged on the Somme, leaving the New Zealanders and the 20,000 of the 5th Division in the Armentieres sector. Between April and June 1916 the AIF 1st, 2nd and 4th Divisions had suffered close to 2,400 casualties, while the New Zealand Division lost a similar number between May and July. By the end of the raids and with aforementioned three AIF Divisions heading south and to the great Somme offensive, the Bois Grenier nursey had lost it’s quiet and backwater reputation, and indeed would shortly be the location for one of the greatest and most tragic events for the Australians during the First World War.